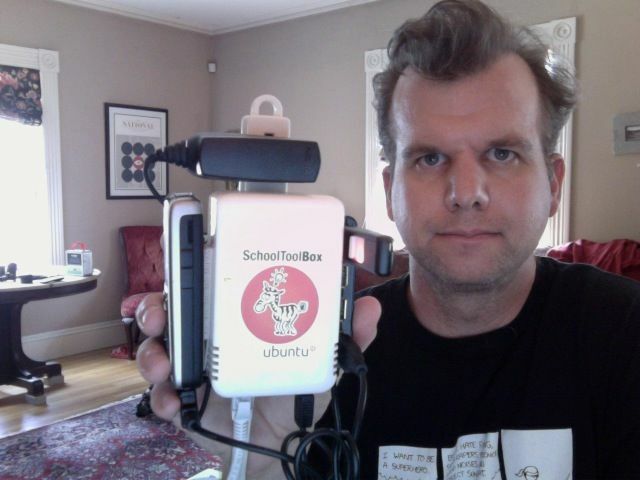 This is the favela chic version of the SchoolToolBox I've been working on to demo using SMS text messages as a data bus to send school data from the hinterlands back to the Ministry of Education (or whatever) when you don't have landlines (and probably never will). So it is a SheevaPlug (via Tonido), with a little four-port USB hub stuck on one side (this should be less necessary as newer versions sprout more ports) with a USB stick for extra data storage. Velcro-ed to the other side is an old Nokia 6021, a model I picked out because it seemed to be highly compatible with Linux. The phone is connected to the plug server via USB, and it is also plugged into the same extension cord as the server. Finally, there's an ethernet cable also ostensibly connecting the server to the school's LAN, or at least a computer with a web browser. I got the phone on eBay and wondered why it was taking so long to get here; when I checked the auction I realized I'd bought it from someone in Israel! So shipping took an extra ten days or so, and it has nice Hebrew letters (and English) on the keypad (and in a few left over messages and contacts). When I put my T-Mobile SIM card in, I had to do some crazy unlock code hacking, but got that to work before I bricked the phone. Now I just have to get the blasted thing to talk to my computer, particularly before the Rhode Island Mini Maker Faire at the end of the month, where I've committed myself to demo-ing it. At the moment I seem to be stuck with the wrong version of the data cable for the phone (doesn't work under Linux or Windows), or perhaps just an overly cheap knockoff, so I'm waiting for what will hopefully be an official Nokia CA-42 cable that will solve all my problems. In the meantime, bluetooth on the phone seems to be broken, it just doesn't turn on when you select it in the phone menu, but I can control the phone over the good old infra-red irda port using Gammu. So that's something, although not actually practical for sending and receiving data from a server.